The most important two words in the book "The Da Vinci Code" is seen in tiny print on its front cover. They are: "A Novel." It is very important to realize that the book is not a documentary. It contains some material that factually correct, some speculation and conjecture, some statements that do not agree with the historical record, some pure fantasy, and some blatant untruths. It is not every copy that admits that the book is really a novel. One edition published by Doubleday for its book club omits the label for some reason that is not clear to us. On Page 1, under the title "FACT," the author states: "All descriptions of artwork architecture documents and secret rituals in this novel are accurate." 1 However, Page 1 is an integral part of the novel. In fact, some of the references to documents in the book are not accurate. One glaring example is his reference to the Dead Sea Scrolls as Christian documents. They are definitely Jewish. The quotients of adjacent terms approaches the number PHI. The ratio of adjacent spirals on a nautilus -- a species of mollusk. The ratios of adjacent spirals on a sunflower seed head. "Spiraled pinecone petals, leaf arrangement on plant stalks, insect segmentation," etc. The figure is shown as wearing male clothing. "Other paintings from that period (Castagno�s 1447 and Ghirlandaio�s 1480) also show John to be a very boyish or feminine looking figure with long fair hair. This was because John was supposed to have been the youngest and most unquestioningly devoted of the apostles. 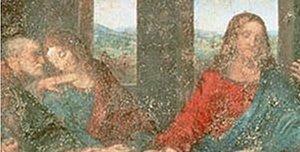 Hence he is often shown asleep against Jesus' shoulder. It was common in the period to show neophytes as very young or even feminine figures, as a way of showing their inferior position." Dan Brown, "The Da Vinci Code," Doubleday, (2003), Pages 93-96. Read reviews or order this book safely from Amazon.com online book store.